At an astoundingly low price for such quality and style. Enhance fit and breath ability. Effectively eliminating bunching and providing a superior fit. Size: All sizes Youth & Adult. Great grip in warm conditions. Nice style and design. Grips club nicely. Seamless on palm felt club better. No slippage of club in hand. A high-tech tanning process allows DEL golf gloves to outperform and outlast other leather gloves by nearly 4 to 1. Gloves are shaved to 0.40mm - 0.45mm for added feel and control. Sheep leather qualities and the thinness of the golf glove allow for low perspiration levels. Right and left hand available in all sizes .. 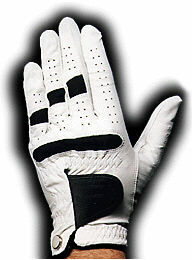 Premium all weather synthetic golf glove, the thinness allow low perspiration levels. Right and left hand available in all sizes.